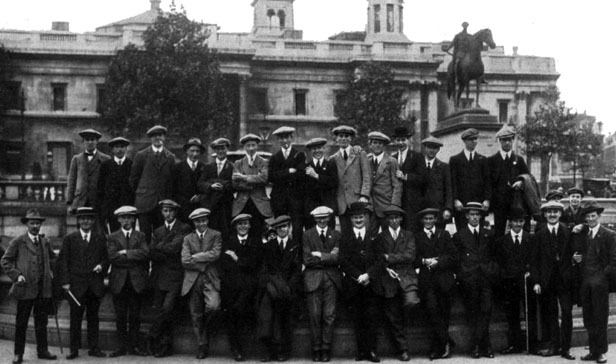 Golf professionals and clubmakers were, like every other section of society, affected by the First World War. Many clubmaking businesses went bust (Spence and Gourlay and Anderson and Blyth are two in St Andrews who met this fate) for the want of raw materials or trained staff, with their clubmakers in the trenches there were many hearings where business owners sought call-up exemption certificates for their most skilled workers. Alex Marling and George Smith just left their business Marling and Smith in Aberdeen and joined the Gordon Highlanders, Marling losing one eye, Smith his hearing in the fighting. They resumed their careers after the war as did others such as Ernest Jones despite the loss of a leg. Others though did not return from the war. Indeed, the first British casualty of the war, John Parr, was a caddy at Friern Barnett who lied about his age (he was 16) when he joined the 4th Battalion, The Middlesex Regiment. The list below is not comprehensive though I will add to it over time. Nor is it intended as a roll of honour of those who gave their lives for their country: it is a list of laddies killed in their prime for reasons which even after a century’s reflection are unclear. Able Seaman George William Fernie, clubmaker with his uncle Willie at Troon. Although in the Navy, he was sent as infantry with 'Howe's Batallion' and died on 16.11.1916 from injuries sustained in action at the Somme.